Peel the rutabagas, slice them into strips, and place them in a large bowl. Add olive oil and salt, and toss to coat evenly. Place the strips on a large baking sheet with space between each strip and cook for 12 minutes, turning each strip twice to cook evenly until golden brown. Remove from oven and sprinkle with paprika and garlic powder. Add chopped garlic and parsley for garlic rutabaga fries. Rutabagas are one of those root vegetables that always get passed up at the grocery store. Surprisingly, this versatile veggie can be prepared pretty much as you would a potato. You can mash it, add it to a stew, make a soup, fry it, or in this case, bake it. 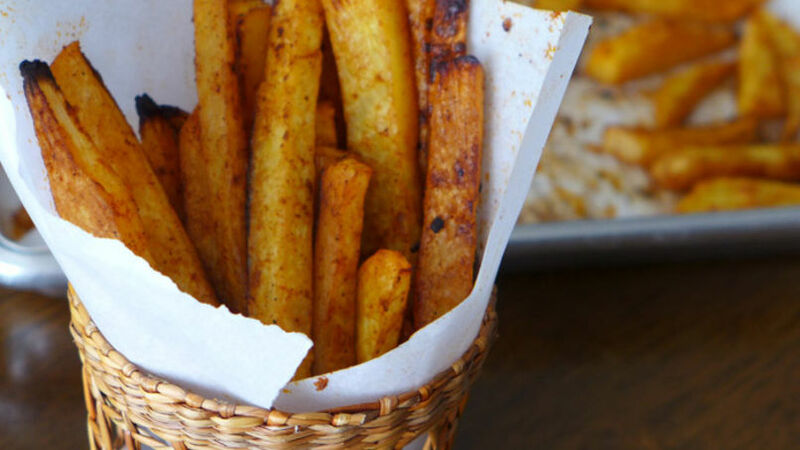 Baked rutabaga fries are easy and quick to prepare. The texture is similar to potatoes but with a slightly different taste that you have to try. They’ll go great with your favorite burger or on their own as a unique but very tasty snack. I bet you’ll enjoy them as much as I do!